Less than two weeks ago, Britain sent a bombshell into the conservative, neo-liberal policy agenda and the narrative that supports it. I have read a lot of comments that the Referendum result was a reflection of racist attitudes towards minority immigrants. While it is no doubt that the open borders policy that allows firms to batter down wages growth and keep a constant excess supply of labour as a threat was an important part of the debate and vote, that in itself, was a reflection of the underlying tension that people and their communities have with the neo-liberal policy agenda. There would be much less concern about migration if there was full employment. The same sort of tensions that pushed the majority of British voters to support the Leave campaign have been apparent in the Australian Federal election which was held on Saturday (July 2, 2016). Australian voters have rejected a first-term conservative government. It is a rare event for us to reject any first-term regime of either persuasion. The conservatives in Australia are now in tatters without credibility and the unstable situation that has arisen as a result of the political uncertainty provides a great opportunity for the Australian Labor Party, who did very well in the poll on Saturday, to refresh their outlook and reject their neo-liberal tendencies to reflect the big shift in sentiment in the Australian electorate. A similar opportunity exists in Britain and I hope Jeremy Corbyn takes it and expunges the Blairites from his own Party. 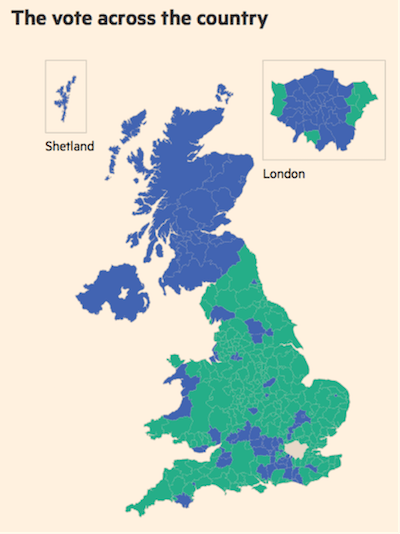 The Referendum results map was stunning (see below) in terms of the regional polarisation that it depicted. But it wasn’t just the regional polarisation that was evident. Divisions across age, education, occupation etc were all evident. Britain is clearly a divided society. 1. 51.9 per cent of voters indicated they wanted to leave – a clear victory. Any attempt by the losers to set the result aside and I expect there will be many such proposals and actual attempts would be disastrous for the nation as a whole given the socio-economic composition of the votes on either side. 2. Voters in traditional Labour areas in Britain defied their own party to support the Leave position. Think about the areas in the North East and in Wales, which emphatically voted to Leave. These are the areas that neo-liberalism left behind and that neglect goes back to the first Monetarist-inspired cuts of the 1970s under Denis Healey. Those attacks were followed by Thatcher’s full-scale assault on the ship-building industry and the coal miners, traditional large-scale employers in these areas. I wrote a blog some years ago that the majority of new jobs outside London (north of the Watford line) in the last decade leading up to the GFC were in the public sector as the private labour market was increasingly hollowed out by the neo-liberal policy settings. And then the Cameron government took over in 2010 and set about implementing an austerity they started to cut public employment, which further damaged these communities. According to the Cities Outlook 2014 Report from the Centre of Cities, 80 per cent of new private sector jobs in Britain between 2010 and 2012 were created in London. British Labour has not been able to provide these communities with a viable alternative given it has been obsessed with the ‘market’ and has advocated austerity-lite – a slight variation of the Tory nightmare. And then Labour came out endorsing the neo-liberal corporate cabal that we call the EU, which has patently failed as a arrangement to produce prosperity. People in northern England might be increasing impoverished with sufficient work but they still understand what the European Commission has done to Greece and they can still appreciate what is happening in Spain and Portugal. Why would they want to be part of that? That is why Labour lost authority in these communities – Labour was advocating continued membership of an arrangement that is now broadly seen as a vehicle of the elites to suppress wages, employment and push more people into compliant poverty. 3. The EU is degenerating rather than becoming a stronger organisation of peoples. It is being seen as a body that serves the self-interest of well-heeled personal and corporate elites. The elites have been prepared to use ordinary citizens and their prosperity as fodder just to maintain political control over an increasingly untenable social and economic settlement. Maintaining unemployment rates above 20 per cent in Spain and Greece indefinitely, is alone, a symbol of the failure of the political system in the EU to deal with reality instead of persist with an austerity-centric ideology. British people knew that and rejected it. The Brexit vote clearly divides the political elite in Britain (remain) and the rest of the population (ignoring Scotland). 4. In the same way that the construction of the Eurozone was deeply flawed, Britain’s entry into the EEC was the result of a con job by Edward Heath who lied about the significance of the decision in 1973 to enter without a popular vote. I dealt with that historical deception in this blog – Britain should exit the European Union. The move towards a single market, which was driven by Jacques Delors in the 1980s, was the first real neo-liberal initiative that became the Eurozone and the Treaty of Lisbon. The policy to allow free movement of people was deeply flawed from the start because it clashed with cultural differences that remain today and which prevent the EU from ever becoming an effectively functioning federation. If you ask me where I come from at any time I will respond Australia. You will get more specific geographic disaggregation if you continue to ask me. But if I ask a German or a Greek where they are from they will never answer ‘Europe’. Nor will a Brit. Indeed, the identity of the British working class is probably less defined in terms of Europe than it would be for workers on the continent proper. 5. The people finally ignored all the dire warnings from neo-liberal economists on the consequences of leaving the European Union. And why shouldn’t they? After all, the track record of this sleazy grouping of IMF, OECD, right-wing think tanks etc has been appalling over an extended period. The IMF admitted a few years ago it made a major mistake in estimating the consequences of the Greek bailout upon which the austerity package was based. Millions of people have been rendered jobless because of these sort of ‘mistakes’. The same economists failed to see the GFC coming despite it being obvious that there would be crash years before Lehmans set it off big time. So why trust the economists who are seen as providing spurious authority to the elites to justify the increasing attacks on working class prosperity. 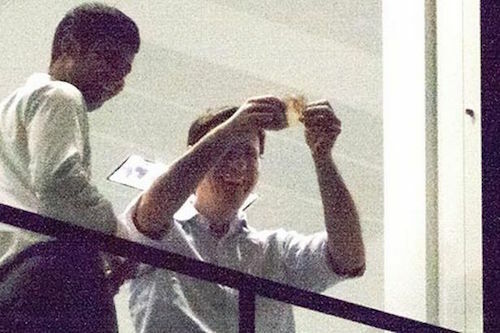 Remember the City of London banker who waved a £10 note out the window of his office to taunt doctors and nurses protesting about the cuts to the National Health Service in March 2011. This symbolised the divide between the ‘coke-headed’ financial market traders making millions and seemingly escaping any scrutiny from the ‘light touch’ regulation that British Labour under New Labour introduced and workers who were concerned with protecting health care standards, the latter representative of the ordinary person. So when the bankers and financial market commentators prophesised doom if Leave won, why would they be trusted? Why wouldn’t their interventions be assumed to be just a reflection of their desire to protect their cosy world of affluence and excess? 6. The ructions in the Labour Party are symbolic of the ideological divide that is represented by the Brexit result. The Blairites clearly have not realised their day has come and gone and want to reinstate their failed vision of British society. I hope that Jeremy Corbyn stands firm and rejects any arguments that he steps aside to ‘save Labour’. The Blairites don’t want to save ‘Labour’ they failed to regain government despite the appalling performance of Cameron in his first term. Jeremy Corbyn should demand that the grass roots branches of the Party de-select every single MP who voted no confidence in him last week. He should insist that their careers end now and promote a new breed of Labour politicians who can represent the workers who have been disenfranchised by the neo-liberal era. And I note the petulant response of his so-called Economic Advisory Committee who have spat the dummy over the Brexit result. Corbyn is better off without the advice of those economists who cannot get away from the notion that there is something important about being a member of a neo-liberal austerity machine (EU). British Labour badly needs advice from economists who understand how the monetary system operates (and that excludes New Keynesians) and who prioritise the well-being of people and job creation and expose the idiocy of proposing fiscal rules like balancing ‘budgets’ now, over a cycle, or anytime as a matter of doctrine. Corbyn’s advisors who have publicly derided him last week are never going to be able to provide that sort of advice. Good riddance. And how does this all tie in to the election chaos that has resulted from the Federal election that was held in Australia last Saturday (July 2). I wrote a background piece to the election, which was held on Saturday, July 2, 2016 last week – We starve the state and public infrastructure development at our peril. I had earlier (on May 4, 2016) written that – Australian government doesn’t deserve office, nor does the Opposition!. The results that are still to be finalised are fascinating. 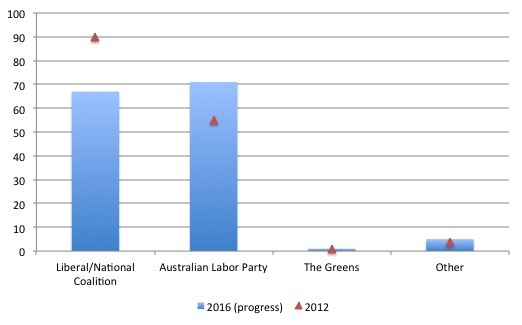 The following graph shows the progress of the count provided by the – Australian Electoral Commission (as at 9.05 Monday, July 4, 2016). There are 150 lower house seats and the AEC are saying 6 remain ‘Not yet determined’. As you can see, the government (Liberal/National coalition) went into the election with 90 seats after a convincing victory in the 2013 election. The major Opposition, the Labor Party held 55 seats, The Greens had 1 seat and there were 4 independents. The latest results for the 2016 election show that the Government has lost 23 seats (now sitting on 67) and labour gained 16 of them (so far), The Greens retained their single seat (a disappointing result for them) and an additional independent won a seat. 6 seats are ‘Not yet determined’ and perhaps 4 to 5 will go to the Government – we will see in about a week about that. The point is that the Government will in all likelihood lose its majority and have to govern in minority status with hostility coming from at least 2 of the independents, The Greens and Labor. Moreover, the Government tried to be cute and called a – Double Dissolution – (that is, forcing the whole lower and upper house to face the vote at the same time) in the hope that it would gain a majority in the Senate (upper house) and be able to push through its pernicious industrial relations legislation as well as other nasty policies in health care, education etc. The early results is that it has made matters worse for themselves – there will now be more independents in the new Senate and The Greens have a solid block. The likely outcome will be that the conservative legislative program will fail to get through the Senate, which means that they will be unable to move towards further privatisation of our national health care system, will not be able to introduce ‘competition’ (dereglation) of our education system and will not be able to further deregulate the labour market. So what does all this mean and how does it relate to the Brexit vote outcome. The outgoing Prime Minister Malcolm Turnbull knifed the right-wing fundamentalist Tony Abbott in September 2015 to take the leadership when it was obvious that the right-wing agenda was being rejected by the people. Abbott would have got slaughtered in Saturday’s poll if he had have remained leader. To overthrough Abbott, Turnbull relied on some of the whacky right in the Liberal party and from that day (September 15, 2016) he has been fatally compromised. The right are climate change deniers, hate unions, want to cut wages, to privatise everything, reduce welfare payments and all the rest of the neo-liberal mantra. They are increasingly out-of-step with the sentiments of the electorate as the vote on Saturday indicated. 1. Abbott had scrapped the Carbon Tax that had been brought in by the previous Labor government. He is a climate change denier as is a significant proportion of the government members of parliament. Turnbull despite supporting a Carbon Tax refused to reintroduce it and went along with the climate change denial policies of his predecessor. Labor campaigned to take climate change seriously. 2. Abbott had scrapped the ‘Optic Fibre to the home’ (FTH) National Broadband network established by the previous Labor government after three to four years of work and replaced it with a higher cost, poorly performing Fibre-to-the-Node (FTN) plan which relied on the ancient copper wire that is agreed by the technicians to be in deplorable condition – see NBN alternative: Is Australia’s copper network fit for purpose? – for example. The copper wire network was laid more than 100 years ago. The right-wingers refused to recognise that their cut-price plan would be inferior to the original Labor FTH plan but the evidence as the network has begun to be rolled out to homes is that there are serious problems with the mixed-node plan and it will date very quickly. Turnbull maintained the FTN policy despite knowing it was inferior. Increasing public angst over the last year over the poor quality Internet service and major and increasing outages has been ignored by the government. Labor campaigned to reinstate the FTH design. 3. Significantly cut spending growth for public education and the Government had proposed that the Federal government only fund private schools and leave public education to the state governments who do not have the resources to ensure the public system maintains quality. Labor campaigned heavily on education to restore funding to public schools and universities while the Liberals hardly mentioned it. It turned out to be a major issue in the electorates that have changed back to Labor. 4. Turnbull’s whole ‘plan’ about “Jobs and Growth” turned on their proposal to cut corporate taxes which would have meant they would forgo billions in revenue. Given their mindset that the budget would have to balanced within 4 years, the corporate tax cuts meant they proposed to cut spending (the Treasurer continually claimed there was a “spending problem, not a revenue problem”). Those cuts were in health, education, transport etc, all things that directly impact on the well-being of Australians. Further, the estimates of how many jobs would be forthcoming from the tax cuts were minimal. It was a transparently vacuous policy approach and the electorate has clearly seen through the ‘plan’ which was not much more than a slogan to hide a lack of policy. 3. The current government has overseen very weak employment growth, a fall in full-time employment growth, rising unemployment, and real wage cuts. Over the last year, Real net national disposable income a very robust measure of material standards of living, has fallen by 1.1 per cent, which means that Australians are poorer now than a year ago. Further, income inequality has been rising under this government and the higher-income groups have been pocketing a disproportionate amount of any income growth that has occurred. 4. The government has also attacked our public health system. Among the changes they introduced were the increases in fees on pathology and radiology, increases in prices of medicine under our pharmaceutical benefits scheme, freezing the bulk billing rebate (which is the amount the government pays private doctors under the national health scheme) with the consequence that visits to the doctor have become more expensive as doctors pass on the freeze in higher gap payments, and they were attempting to privatise the Medicare billing system and were planning to introduce a co-payment for all GP visits. All of these changes or proposed changes were very controversial and attacked the widely supported national health system. 5. The Government proposed to further attack the unions by reintroducing the Australian Building and Construction Commission, which was a nasty government authority, scrapped by the last Labor government. It was deeply unpopular with workers. The right-wing also wanted to scrap penalty rates and other minimum legal working conditions, which were also seen as a threat to low-income workers, who are already precarious and close or below the poverty line. Labor, generally supported the retention of these conditions etc. There were other issues at stake but the issues of climate change, health, education, jobs and broadband were significant. Are you starting to see the parallels with the Brexit outcome? Many of the seats that were lost by the Government on Saturday are in areas where the so-called ‘battlers’ live. These communities have borne the brunt of the right-wing policies that the Government has pursued. When the Government claimed it would cut spending – it was in areas that most affected the disadvantaged. Their first ‘budget’ in 2014 was deeply unfair and led to a slowdown in economic growth and employment. That ‘budget’ led to Abbott’s demise. Turnbull failed to alter the narrative. His tax cuts for corporations and spending cuts for the rest of us were seen as punishing the ‘have nots’ to transfer more to the ‘haves’. Hacking into education and health care spending yet maintaining spending on private elite schools was deeply unpopular. The Government, when it was in Opposition, had claimed the rising fiscal deficit that the previous Labor government had overseen to offset the GFC, was a disaster and would bring the sky down on all of us. It soon found out that it had to let the fiscal deficit to rise even further because of the economic slowdown. The so-called emergency and impending disaster soon disappeared from their daily diatribes. It made the earlier claims that the deficits would be a disaster look hollow. Even though the Labor Party maintained the need for a fiscal surplus mantra, it also proposed significant increases in public spending in the next two years to revitalise public education etc. The voters clearly supported that idea rather than the spending cuts and tax cuts for the well-heeled proposed by the conservatives. Just like the Brexit vote, the orthodox economic line promoted by the Government has been rejected in this election. People care about health care, public education, public transport, employment protection, etc and know that the state has to take responsibility to deliver in these areas. The resonance of neo-liberalism is starting to wane. Further, a few weeks ago I tweeted a link to a campaign to get rid of the right-wing conservative candidates who had supported scrapping the most progressive policies (noted above) – the so-called ‘blockers’. This was a campaign orchestrated through the GetUp Action group, a community networking body that pushes progressive issues and seeks to redress the anti-democratic trends that neo-liberalism has promoted where big corporate money disproproportionately influences policy outcomes. It raises funds from ordinary folk and use the resources to advance progressive issues. The 2016 Federal election campaign was their biggest yet. These so-called right-wing ‘blockers’ have been trying to prevent the development of renewable energy in Australia and also have been working on privatising our national health system. They also played a key role in wrecking the initial plans to develop a world-class broadband fibre network for the nation and want to bring in more pernicious anti-union legislation and scrap weekend penalty rates for low-wage workers. That is just a part of their extreme neo-liberal agenda that the outgoing Government had been pursuing although with some difficulty given it did not dominate the upper house (the Senate). The election results that we already have clear data for from Saturday tell us that this campaign might have helped rid some of the worst of these right-wing members from the next parliament. Out of the 12 seats lost by the Government so far, eight were held by right-wing blockers who held us back on key issues like climate action and funding for our schools and hospitals. That includes Tony Abbott supporter Andrew Nikolic in Tasmania, who lost with a gigantic swing of 10.4% that no-one saw coming. And Immigration Minister Peter Dutton’s seat of Dickson is still hanging in the balance, with a 5.9% swing against him (that’s twice the state average). So that is a pretty handy outcome for a united and organised action from a progressive network of citizens. The conservative agenda in Australia has been significantly dented by Saturday’s election outcome. Not fully but substantially. The neo-liberal disregard for the well-being of the ordinary folk has been called to question. It is extremely rare that Australians reject a first-term government. It did just that on Saturday. In doing so, it rejected the economic orthodoxy and wants the government to protect public education, public health, do something about climate change and protect working conditions (among other things). The public wants the government to be responsible for large-scale infrastructure that takes us into the next century. It has rejected a reliance on the ‘free market’ approach, which means it has rejected a government that pursues a policy agenda that benefits the elites at the expense of the rest of us. I see that as being the same forces that led 51.9 per cent of British voters (who voted) to vote to leave the European Union. And, just as in Britain, the conservatives are are now turning on themselves. But, just as in Britain, this is a major opportunity for Labor to reassess its own neo-liberal leanings and revitalise their policy positions to reflect the needs of the vast majority of citizens. Australian Labor did offer some progressive options in education, health, infrastructure etc despite still being wedded to the surplus obsession. They now have the opportunity to win much wider support (their primary vote is still down). I hope they take that opportunity, just as I hope Jeremy Corbyn purges his own party of the Blairites and create a new, progressive future for the British Labour Party. Forget the so-called Left campaigns that aim for a united democratic Europe. They will go nowhere. There is a new campaign that is gathering pace – LEXIT – or Left Exit. instead of Neoliberal Integration and a failed Euro-System” and is soliciting support. I rarely sign up to these sorts of movements (including petitions, letters etc). But I have given this (ad)venture my unconditional support because I think it is the only way ahead for a progressive Left future. The LEXIT-Network is seeking members and you can sign up to indicate your support – HERE. But please read the general statement to make sure you are okay with it before you sign. The Network is about EXIT – which means out of the Eurozone, out of the EU, out of so-called free trade agreements etc. It will re-establish national sovereignty and provide progressive forces with a focus on how to push their polities in the desirable direction. I hope it becomes a massive movement. It’s pretty clear that the Brexit deniers in the UK are closing ranks to maintain their cosy cabal. Project Fear has morphed into Project Remorse and they are trying to get their favoured candidate, Theresa May – essentially a Blaire in Blue, installed as Prime Minister. They realise they need to buy off/scare/dupe about a million people to shift public opinion towards maintaining the status quo. Labour are helping that process by corralling the Labour Leader in the same way as they have corralled and contained millions of working class people in their deprived ‘reservations’ in the North for two generations. I’m hoping that by continuing to educate and assist people we can change the direction of both Britain and Australia, without having to go to the end point of electing a demagogue. Because that’s where it will end if this continues. I can think of a couple of Aussies who might be keen (pun intended) and fit that bill (pun also intended) quite nicely. The main job is prising him away from Wormtongue-Lewis (pun intended). I just can’t see the Labor Party or any party ridding themselves of the idea that a surplus is ‘savings’. I can’t see any future government abandoning matching deficits with bonds. I can’t see the Labor Party lifting unemployment benefits (Gillard didn’t do it when even the Business Council of Australia agreed it should be higher!) let alone offering a job guarantee. I know there is an enquiry into the effects of casual employment in Victoria but I suspect we will not see a focus on secure employment creation anytime soon. When I look to our future all I see is rising inequality and a less secure existence. Even our most ‘socially’ and ‘environmentally’ conscious parties are stuck in a neoliberal way of thinking of the budget. Congratulations on ousting the conservatives. I just hope that the new leader doesn’t turn out to be the disappointment for you that O’bummer did for us. My thoughts too! Labor does not seem to “get it” or if they do understand the capacity of a currency issuing government they show no sign of it. It is possible they do understand but are not confident of being able to explain it to voters. After all, if we have great difficulties getting friends and family to grasp the counter-intuitive reality think of pollies who have to impart a message in a less than one minute? All well said Bill. The “Precariat” have had their voices heard at last, courtesy of Brexit. And it draws attention to the Trump phenomenon, reflecting the same anger and frustrations. Even our election has shown that all our politicians are woeful and incompetent economically as well as slaves to their moneyed masters. Hopefully they will give a hoot before it all falls apart, but I doubt it. We are, at last, at the start of the beginning of the end of neo-liberalism! There is another political party here, just seen by me last week. They support MMT and give your site a mention. It seems worth supporting as well. Do you agree? Your Lexit organisation seems a european based site so they don’t double up on one another. Thank you, Bill , for advising Lexit. Wouldn’t it be time for European banks to become part of government. It seems they will be buying a great deal of shares again soon, collapse of Italian banks pending. Wouldn’t you say the only safe future-proof strategy is to nationalise the banks and to end commercial banking? I’ve had some success with reversing the narrative around the deficit – framing it as a public surplus and they want the public to go into debt (deficit) with the Government surplus. I like your simple explanation about debt issuance; I will try to use it though the “my taxes are needed to fund government spending” myth is very strong. I am not sure though about your proposal to issue public debt. Would it avoid losing control of the target interest rate? The thing that upsets me most about the post-Brexit hysteria here in the UK is the torrent of snobbery it has unleashed and the widespread contempt shown for the principle of one-person one-vote. Polls showed that for all demographic groups, the main reason for voting Leave was “The principle that decisions about the UK should be taken in the UK” http://lordashcroftpolls.com/wp-content/uploads/2016/06/Leave-vs-Remain-podium-rankings.jpg . Yet there has been a clamor that the Leave voters were racist imbeciles who’s votes should be ignored. @Jengis. I know. I despair too sometimes. A lot of the time actually. But the tide is changing. A lot of diehard baby boomer LNP voters have told me the government only kept their vote because the scare campaign about the ALP bringing the boats back worked. They hate what the government is doing to ordinary people which is why they fear immigration. And as a demographic more and more baby boomers are voting with the young for the young in disgust at how the young are being treated. I’m not having a shot at baby boomers they’re just such a big voting demographic! Now if only more young people would vote and boost progressive numbers! @Chris Herbert Good tip! I’ll follow your example. Thanks! I’m from the UK originally but have lived in Australia for a very long time. Since the Brexit vote I have become convinced, by reading widely (including this excellent article), that the EU is a failed neo-liberal experiment which acts against the interests of most ordinary citizens and benefits only the more wealthy elites. Couldn’t Brexit’s proponents have made their case at least as convincingly, and probably much better, by explaining the arguments that this article does so well? I can assure you all that the ‘leave’ vote had a lot less to do with immigration than the media would have you believe. I can also assure you that it had absolutely nothing to do with racism or xenophobia or bigotry or prejudice. All those accusations are defaming a nation. We were offered a simple choice. We understood the implications. We made the choice. All the rest is projection, defamation and denial, and we are heartily sick of hearing it. PS Please also don’t try to pin things like ‘the ‘Leave’ campaign’ or ‘the ‘Leave’ side’ onto the public. The official ‘Leave’ and ‘Remain’ campaigns had nothing to do with us. They weren’t formed by us, they weren’t run by us, they weren’t chosen by us, they didn’t consult us, they don’t represent us, they don’t do our bidding, they don’t answer to us, they can’t be held to account by us, they have absolutely nothing to do with us so let that one drop please. Additionally, there are more than two ‘sides’ to the issue, and all this talk of ‘this side lied’ (yes, both the official campaigns, plus the government, lied, as politicians lie every time there’s an election… and when there isn’t one too) has grown extremely tiresome to say the least. Jim, I understand your disgust with the two campaigns and the government. I’m just a disinterested observer on the other side of the world, but from where I sit it’s shameful that nobody in government and nobody officially representing the two campaigns seems to have made any attempt to explain the (real)implications of this, arguably the most important decision taken in my native country since the second world war. As a result the entire country has voted on this issue while drastically under-informed, and now nobody seems to know how the process will pan out and what the long term effects will be. That’s a disgrace. Didn’t anyone see this coming?